Alright, so this is pretty pathetic: 4 months go by and the only post is a dumb “here’s how you update the firmware on your OBDII adapter”? Lame. Back to the point of this post, I found a VeriFone Tranz 330 in the garbage a while ago. I finally rediscovered it under a bunch of junk on my bench and decided to take it apart. 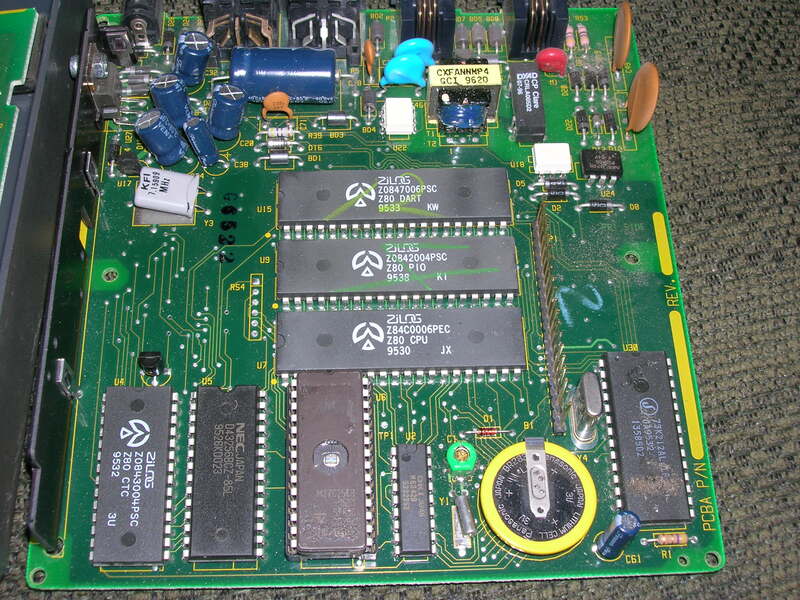 Inside, there is a complete Z80 computer complete w/ RAM, ROM, RTC, timer, serial chip, and parallel I/O. Yeah, yeah, all this stuff comes in many microcontrollers these days, but this stuff was cool 15-20 years ago! Just by chance, I searched for hacks on this thing, and this guy’s site appeared which claims to unlock the secret music stored on your credit card! Yeah that’s a lie =). There really isn’t music stored on your credit card that this thing plays. Rather, Steve Chanberlin reverse engineered the Tranz 330 and wrote a music playing program to replace the ROM in the unit to run his new code instead of their “boring” point-of-sale code, as he puts it =). All it does is use the account number and expiration date to generate random notes and tempo from that information on your card. He explains all that better on his site. The cool thing is this all brought back a lot of memories. I really wanted to stick the music playing code on my Tranz 330, and swipe some cards. After all was said and done, it all works, and as expected, the music playing novelty wore off quickly. But I did unearth my old Needham’s PB-10 8-bit ISA programmer, an old 200MHz Pentium mobo that still had ISA slots, and most magical of all, a working floppy bootdisk created who knows when! The hardest part of getting all this to work was the computer itself. Something this old doesn’t know what to do w/ the massive hard drives of today, and for whatever reason, the boot cds I have don’t work properly on this old machine, even though it’s capable of booting off the CD drive. Luckily I keep 2 spare floppy drives just in case and I happened to have a 20GB drive that it actually liked. Luckily the controller is all built into the mobo. I was going to use an old 386DX-40 mobo I have, but that was missing a hard drive/floppy controller card. Once the floppy booted, I was able to set the 20GB drive up to just run DOS. The PB-10 software runs DOS and I don’t think I even have version of Windows to put on the PC if I wanted to. My Win98SE disc broke not too long ago, but meh, I’ll never need that again, right? XP won’t work on this as it only has 32MB of RAM and XP needs a minimum of 64MB, both of which are laughable =). Some USB floppy drive and copy/paste action later, and I “burnt” the freshly assembled code into a spare 27C256 EPROM. I never thought I’d program one of those again. Oh yeah, this also required me to find my UV eraser (Walling Datarase). Luckily I found it and the bulb wasn’t shot, so I stuck 2 EPROMs in it and 10 mins later they’re ready for programming. Installed the EPROM into the Tranz 330 and yay it does cool stuff. I think I’ll look into the C compiler for the Z80 and maybe make this do something more. I mean the serial port, RTC, and keypad are all mapped out by Steve (mem address locations and such), so might as well use them! Alright so that’s my trip down memory lane. Looking at the old computer systems of the 1980’s era are what got me interested in all this stuff to begin with. I really wanted to make my own computer some say, like others were doing those days (although I was like 7 or 8, and doing so then wouldn’t really be too possible as the DIY kits were from late 70’s or early 80’s). Eventually I did make my own Motorola 68K computer from scratch, but stuff like this is where that interest began.